Anyone that can purchase equipment and operate it can call themselves an electronics manufacturing services provider. In the electronics industry, certifications are something typically required by contracts with the government and defense and transportation industries. Most small to medium businesses do not require quality certifications to be held by the electronic manufacturer that they partner with. So, if it isn’t required, why should you care about the quality certifications? If quality is not a major concern to you and producing products that were not constructed using defined processes to ensure they are designed and built to function as planned, then you shouldn’t care. However, the fact is that most of us do care about quality and want to produce the best end product possible to build loyalty within our customer base. There are countless benefits to working with an electronic manufacturing service or EMS with quality certifications and processes in place. ISO is the International Organization for Standardization, which is a non-governmental organization encompassing over 160 countries. ISO is tasked with creating standards across different industries to ensure processes, services, and materials are fit for their purpose. Choosing a contract electronics manufacturer who is ISO registered means you’re getting a partner who’s committed to continual improvement and standards for customer satisfaction. The most common ISO certification in manufacturing is the ISO 9001 certification, which requires that companies find innovative solutions for cost reduction and quality concerns. This helps ISO 9001 certified businesses exceed customer expectations and enhance safety standards. Company engagement. The entire staff must work together to manufacture quality products. Leadership creates a positive culture that increases an operation’s efficiency and ability to create quality products. Processing standards that ensure a high-quality product with efficient delivery. Evidence-based practices. Contract manufacturers back their decisions using data, analytics, and evaluation criteria. Manufacturers create efficient relationships with other suppliers, staff, and third-party vendors. The ISO 9001 certification creates universally recognized standards for quality assurance, improvement, and customer satisfaction across several industries, including electronics. Clients who choose a certified electronic contract manufacturer can take comfort in knowing that every effort will be made to ensure that their products will be delivered on time and will be of the highest quality. Remember, these certifications are designed to push manufacturers to exceed customer expectations. To achieve these certifications, electronic contract manufacturers must address some of the most common supply chain concerns such as risk mitigation, time lags, internal and external miscommunication, and cost. Yearly audits conducted by independent auditing companies ensure that businesses optimize their processes to consistently deliver superior products. 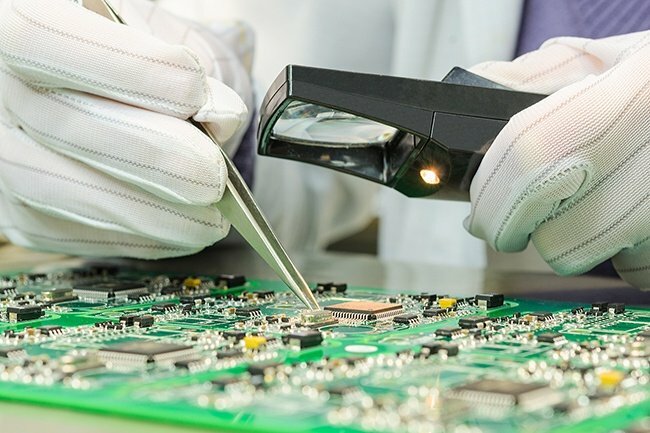 Choosing an ISO certified electronics manufacturing company makes good business sense, as it will save you time and money while delivering a product that will boost your customer satisfaction and loyalty. An ISO certification may not be a strict requirement for electronics contract manufacturers, but this seal of approval will help your production process run more smoothly. Knowing that you’re in good hands from day one can save you time,money, and frustration– invaluable commodities for your small to mid-sized business. A certification means higher quality processes and products, superior customer services, and processes that are continually improving. For this reason, companies should strongly consider an electronics manufacturer with an ISO certification. Levison Enterprises strictly adheres to our ISO 9001 quality standards. Regardless of whether your project has an ISO certification requirement, your project will get the same attention to detail as projects that do. Call us today for a free estimate to discuss your project build.